To use an HDMI cable on your Apple laptop, please review the following steps and tips. Once plugged in, you may need to change the audio source on your laptop so that sound comes out of your classroom speakers instead of the projector's speaker. To do so, follow the steps below. 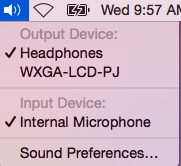 While holding down the Alt (Option) key on your keyboard, click the volume icon in the upper right corner of your screen and make sure "Headphones" is selected. If it isn't, do so by clicking the name.